Grist has a look at the latest IPCC report - What the IPCC found: The big news from the new climate assessment and The scary, the cautionary, and the stupid: Reactions to the IPCC climate report. It’s extremely likely that humans have been the dominant cause of global warming since the 1950s, according to a landmark report from the world’s top panel of climate scientists. And we’re failing in our efforts to keep atmospheric warming below 2 degrees Celsius, or 3.6 Fahrenheit, which many scientists say is needed to avoid massive disruption. 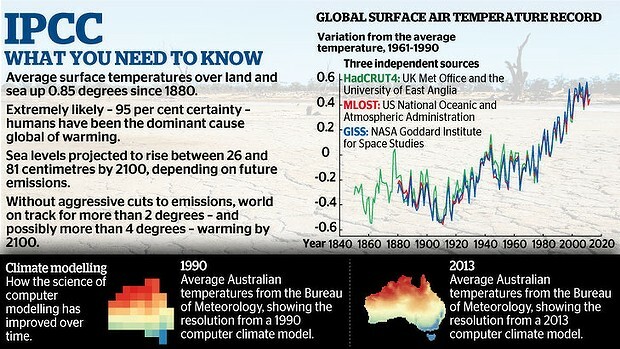 The Intergovernmental Panel on Climate Change conducted an epic review of climate research over the last three years. It is summarizing the most important findings in its fifth assessment report, which offers the clearest picture science has ever painted of how humans are reshaping the climate and the planet. Human influence has been detected in warming of the atmosphere and the ocean, in changes in the global water cycle, in reductions in snow and ice, in global mean sea level rise, and in changes in some climate extremes. … Warming of the climate system is unequivocal, and since the 1950s, many of the observed changes are unprecedented over decades to millennia.